Background: This review provides an overview of the cellular signaling of nitric oxide (NO) and prostanoids in vascular cells and the possible cross talk between their pathways, mainly in hypertension, since the imbalance of these two systems has been attributed to the development of some cardiovascular diseases. It also deals with the modulation of vasodilation induced by NO donors. NO is a well-known second messenger involved in many cellular functions. Objective: This work focuses on the cellular mechanisms involved in the vasodilation induced by NO and the role of prostanoids in contractile or relaxing vascular responses. 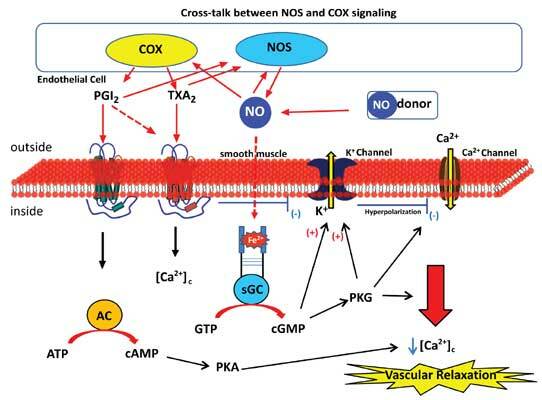 Since the NO is produced by NO-synthase (NOS) or released from NO donors we also discussed the perspectives to cross talk between NO and COX pathways on the vascular tone control. Conclusion: In the vascular system, the NO produced by endothelial NO-synthase (eNOS) or released by NO donors acts in vascular smooth muscle cells, the binding of NO to Fe2+-heme of soluble guanylyl-cyclase (sGC) activates sGC and the production of cyclic guanosine-3-5- monophosphate (cGMP). The second messenger (cGMP) activates protein kinase G and the signaling cascade, including K+ channels. Activation of K+ channels leads to cell membrane hyperpolarization and Ca2+ channels blockade, which induce vascular relaxation. Moreover, the enzyme cyclooxygenase (COX) is also an important regulator of the vascular function by prostanoids production such as thromboxane A2 (TXA2) and prostacyclin (PGI2), which classically induce contraction and relaxation, respectively. Additionaly, studies indicate that the activity of both enzymes can be modulated by their products and reactive oxygen species (ROS) in cardiovascular diseases such as hypertension. The interaction of NO with cellular molecules, particularly the reaction of NO with ROS, determines the biological mechanisms of action and short half-life of NO. We have been working on the vascular effects of ruthenium-derived complexes that release NO. Our research group has published works on the vasodilating effects of ruthenium-derived NO donors and the mechanisms of vascular cells involved in the relaxation of the vascular smooth muscle in health and hypertensive rats. In our previous studies, we have compared the new NO donors synthesized by our group to SNP. It shows the cellular signaling of NO in the endothelial and vascular smooth muscle cells. Nitric oxide, cyclooxygenase, cellular signaling, reactive oxygen species, endothelial dysfunction.